FRAMINGHAM, Mass.--(BUSINESS WIRE)--Jun. 20, 2013-- Staples, the world’s largest office products company, today announced the launch of its first omnichannel stores, which combine the power of the company’s expansive retail network with the digital capabilities of the world’s second largest internet retailer. The stores, located in Norwood, MA, and Dover, DE, incorporate Staples.com and Staples' mobile assets into the retail experience, letting customers shop how they want. 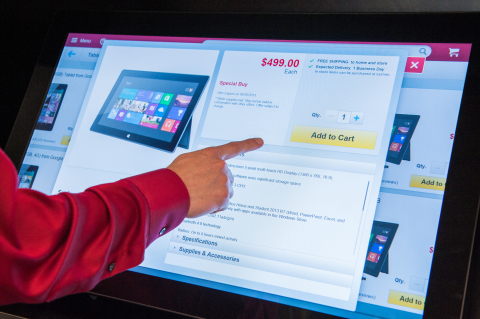 The stores feature several new Staples.com kiosks, providing customers with access to more items than ever, as Staples continues to drive towards its vision of providing every product businesses need to succeed. Through the kiosks, customers can select from more than 100,000 items, including the latest tech products, furniture, school supplies, and cleaning and breakroom items. And, Staples.com offers free, next business day delivery to more than 98 percent of North America. When they’re done shopping, customers can either complete their transactions at the kiosk or the store register. The omnichannel stores also feature consultation areas for small business customers who need help from Staples EasyTech™ and Copy and Print associates. In addition to the new omnichannel stores, Staples recently launched its industry-leading Staples Rewards program with new benefits that include five percent back in rewards on everything and free-shipping from Staples.com. The Plus and Premier Staples Rewards members receive free Staples EasyTech™ services and Office on the Go services for the mobile small business owner, including shredding and scanning.